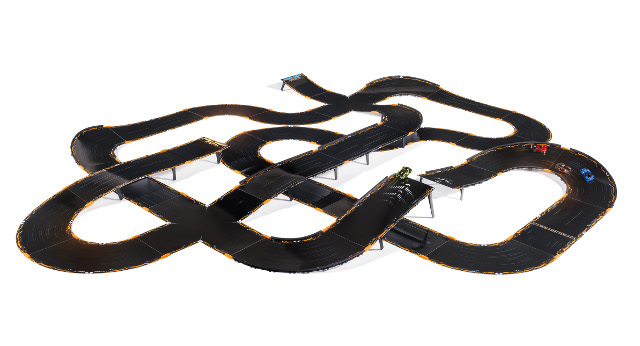 Anki Overdrive brings videogame racing to life with robotic cars and physical tracks. 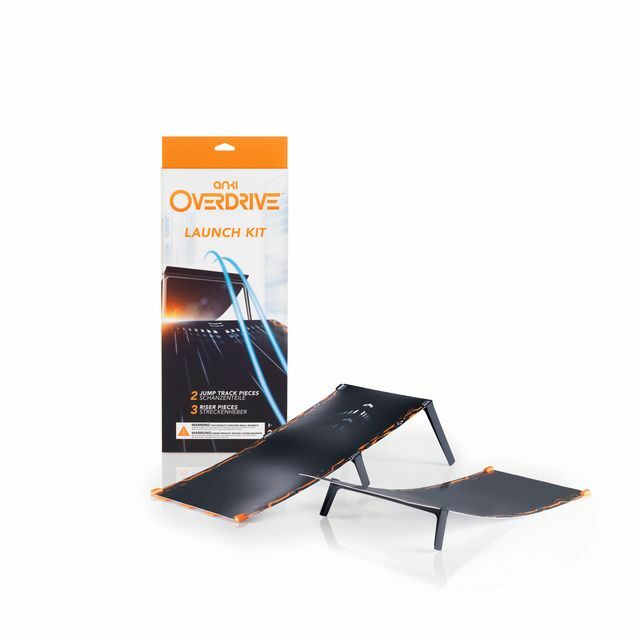 It’s the successor to last year’s Anki Drive and it really takes the concept to a whole new level. 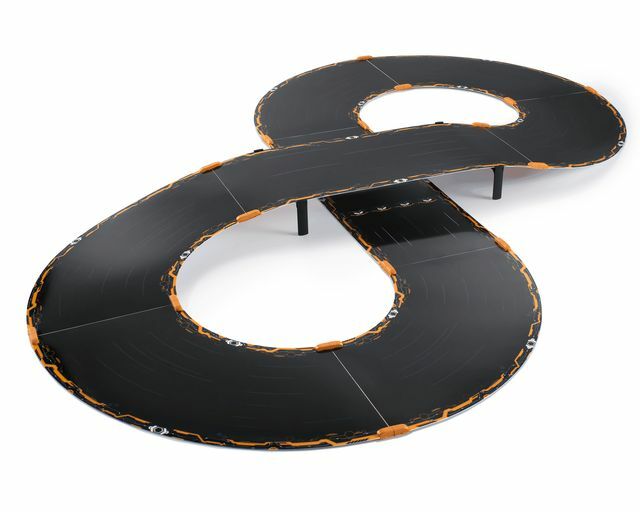 At first glance it looks like some kind of Scalextric but it’s actually way more advanced. 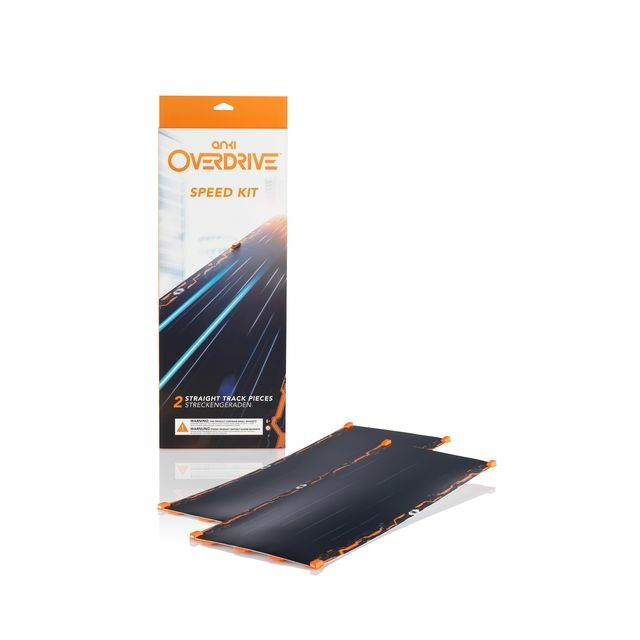 To play Anki Overdrive you need at least the Starter Kit (£149.99) and a recent iOS or Android Phone/Tablet with the free Anki Overdrive app installed. 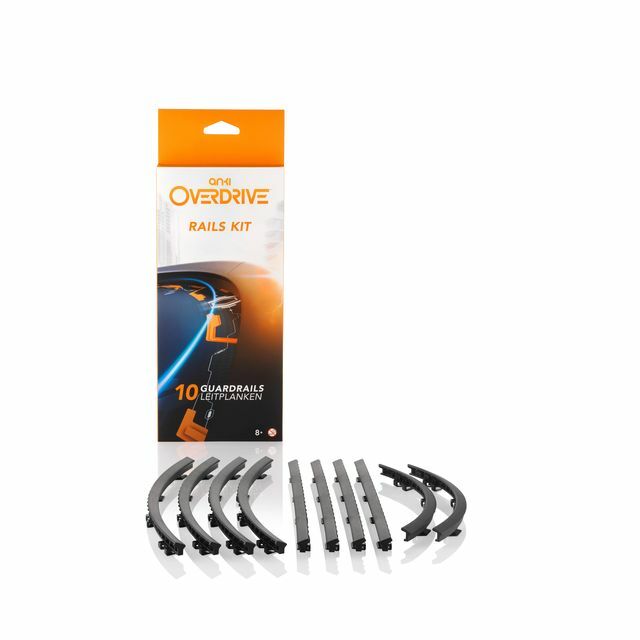 The Starter Kit comes with two cars (Skull and GroundShock), a four car charger, tire cleaner, riser pieces and 10 track pieces capable of making eight different tracks. The Starter Kit comes in a huge box and everything is extremely well packaged. To get started it’s best to stick your cars on charge while you build a track. The charger is capable of charging four cars simultaneously and they charge in 8-10 minutes. Once charged they display a solid green light. A full charge gives you around 20 minutes of non-stop racing. This doesn’t sound like a lot but it’s plenty to get a few races in and then you can stick them back on charge while you reconfigure the track. Track building is an incredibly easy process thanks to each track piece featuring small but powerful magnets at each end. Connecting pieces is as easy as placing them near each other and they just snap together. 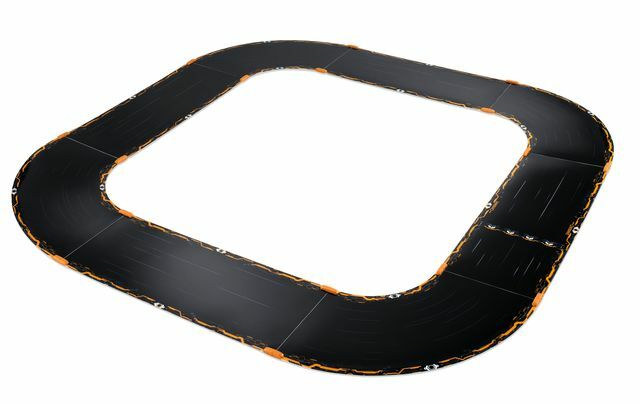 The magnets are strong enough to keep pieces secure during races and it’s even possible to slide the track around without your hard work getting destroyed. If you change your mind or want to put the track away then a little pull is all that is required to separate pieces again. 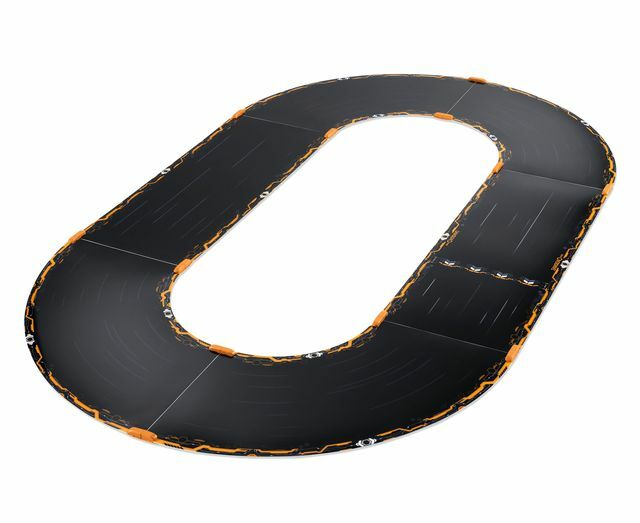 The track building is so simple that even young kids will be able to do it without help. 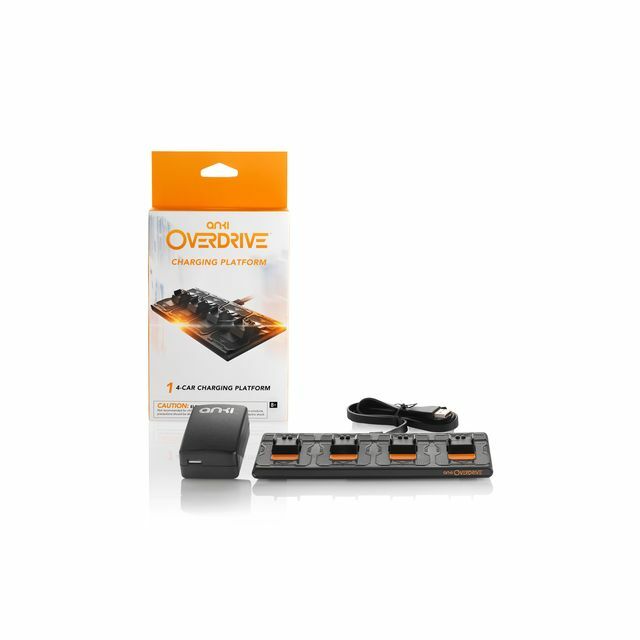 After building a track and charging your cars it’s time to fire the Anki Overdrive app up. 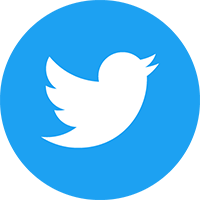 The app automatically detects which cars you have via Bluetooth and will update the software in the cars if necessary. There’s a little tutorial race to get you started where you race against an AI player called Crashbot. Before you race you are given first choice on which car you want to use and then Crashbot picks his. Each car comes with its own stats in speed, defense, firepower and special categories. They also have their own unique set of weapons. The AI drivers also have their preference on which car they like to drive the most. Next you must place the cars anywhere on the track and select ‘Begin Scan’ on the app. This next bit is magical and never gets old as the cars suddenly come to life and automatically drive around your new track. As they scan the track its layout appears on your device. They will go round the whole thing and even turn around if necessary until they are happy they have the full layout. Once the scanning is complete the cars will head to the starting grid and line up ready to race. 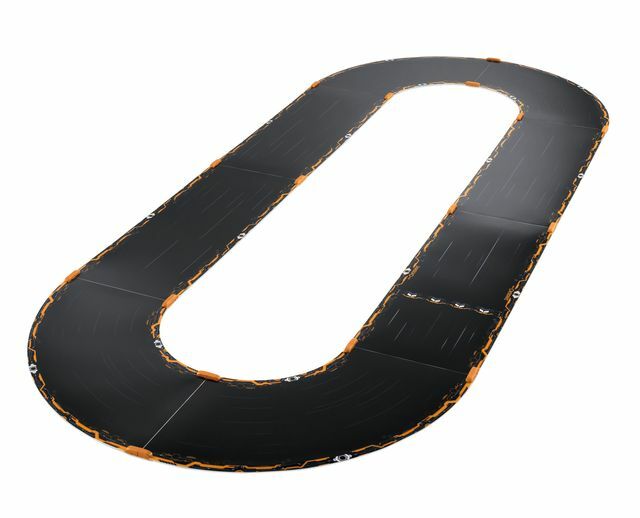 When the race begins the cars will automatically drive around the track on their own. This is an important point so don’t expect to have full control over what your car is doing. The player has the job of controlling the speed, track position and weapons. A slider on the left of the app is used to speed up and slow down your car. Tilting your device left and right will command your car to move to a different lane on the track. 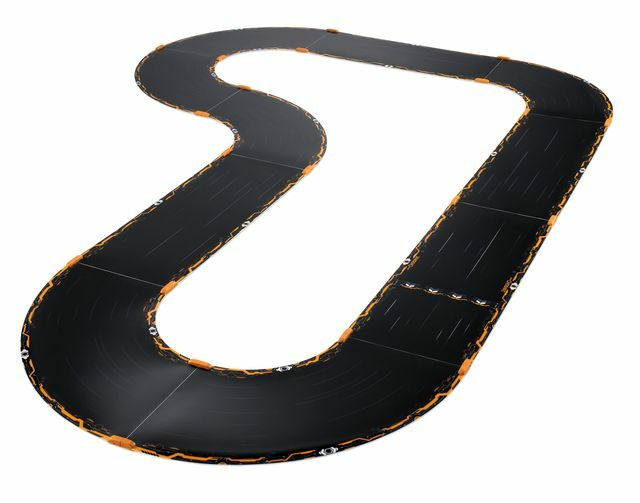 Moving into the ideal racing line gets you round the track faster and takes practice. Weapons make the racing really tactical as they can influence the cars of your opponents. Some weapons require you to get directly behind an opponent in order to shoot them. Others are better at defense and can prevent an opponent overtaking you or getting too close. One of the most useful is a tractor beam that is capable of slowing an opponent down so you can get close to them. If you’re playing solo then you can use the app to take part in a full campaign style tournament where you go up against a huge variety of AI drivers. Here you’ll race and battle in a variety of modes and winning earns you new upgrades and weapons. In between races you can take your car to the virtual garage via the app to configure your car for the next race. 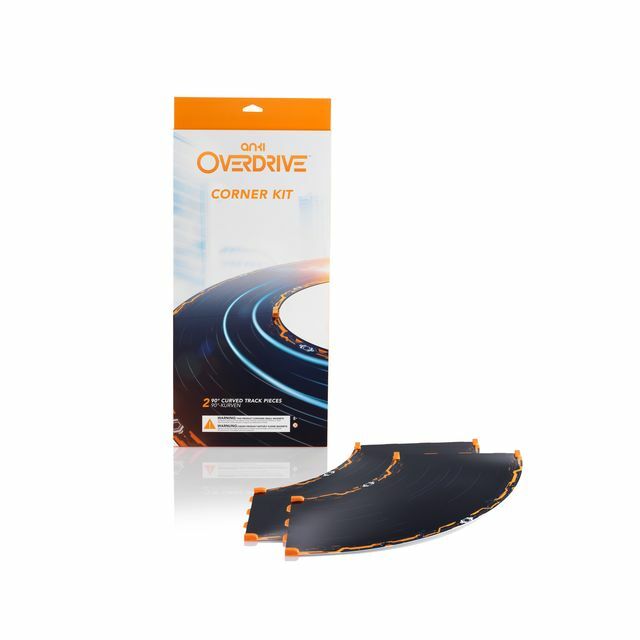 Racing solo against the AI is fun but Anki Overdrive is best played with your mates. To play multiplayer races you need a car for each player and a compatible iOS/Android device each too. Four players can play at a time and you can also substitute players for AI drivers if you wish. There are four different modes to play – Race, King of the Hill, Battle and Time Trial. Race takes place over a set number of laps and is a straightforward first to the finish line wins. In King of the Hill the winner is the player who can stay at the front the longest. Battle is all about the weapons and the winner is the player who takes out the most opponents. Finally Time Trial lets players race one at a time and the fastest time wins so it’s important to master the steering so you can take the racing line. The cars look fantastic and each has its own unique look. They also feature lights to indicate certain things such as when you fire your weapons. There are also headlights and brake lights making it possible to race in the dark for a different experience. The cars are surprisingly fast and it’s mesmerising just watching them snake around the tracks that you build. As you race the characters in the app will talk to you and sounds effects are played as you accelerate and use your weapons. Occasionally a car might crash into another or end up falling off the track. When this happens you sometimes have to intervene and place the car back on the track. However at times they are able to find their way back onto the track and into the race all on their own. 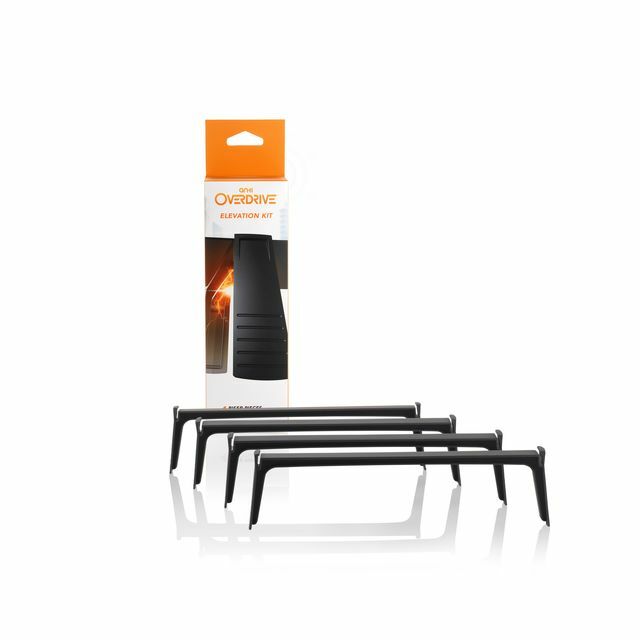 On top of the Starter Kit you can also purchase a variety of expansion kits such as Speed, Corner, Collision, Launch, Rails, Elevation and Bank Turns. 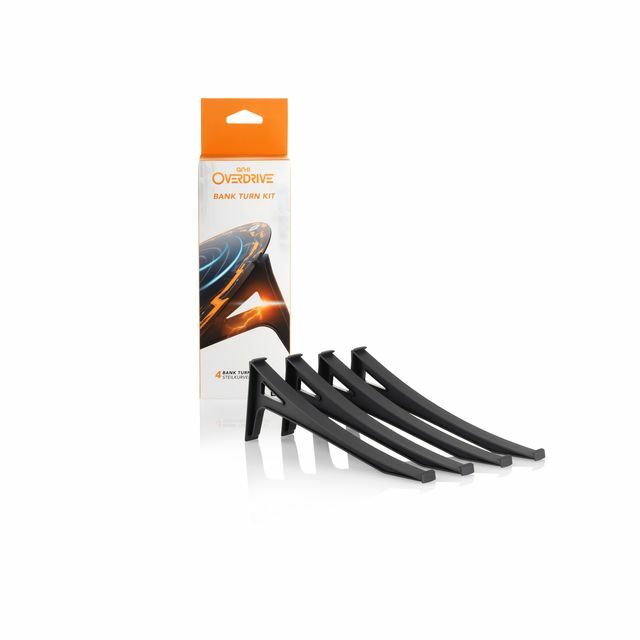 These come with additional pieces allowing you to make bigger and more varied tracks. There’s no limit to what you can build and these expansion pieces really do make things even more exciting. 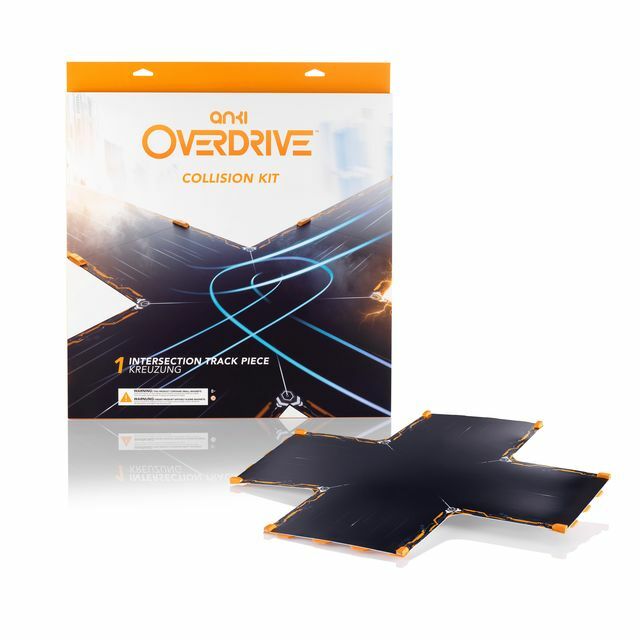 The Collision kit adds an intersection where cars will cross while racing increasing the chance of collisions, the Rails kit gives barriers to keep your cars on the track and the Launch kit give you a ramp so you can add a jump into the action. Also coming soon is a 180 kit allowing you to add in dead-ends where the cars will automatically turn around. Bigger tracks lead to more interesting races but do take up a lot of space. 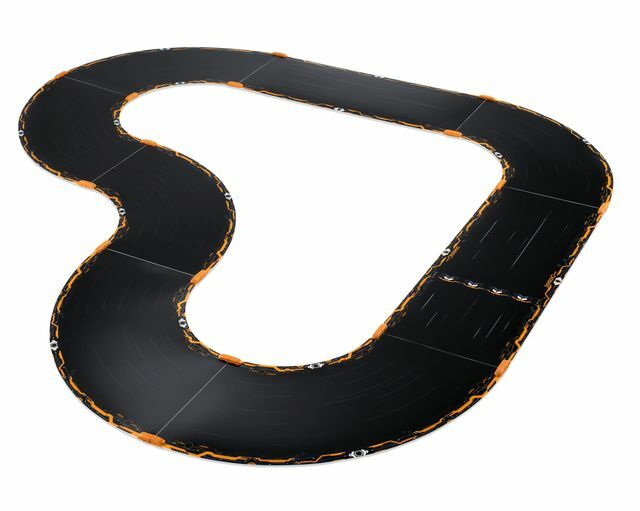 However with some creative thinking you can lay a track out all over your room. It’s possible with the use of cushions, books, DVD’s to create bumps and hills. There’s no reason the cars can’t zip around the legs of a table and then race up a climb across the sofa before plunging back down to the floor. 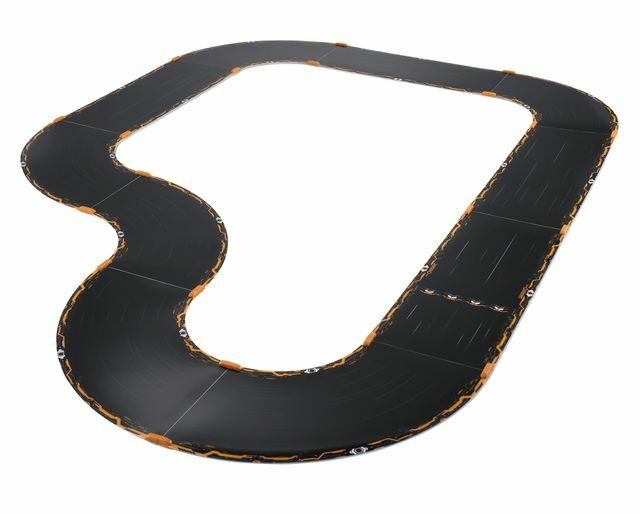 Anki Overdrive provides a thrilling racing experience. 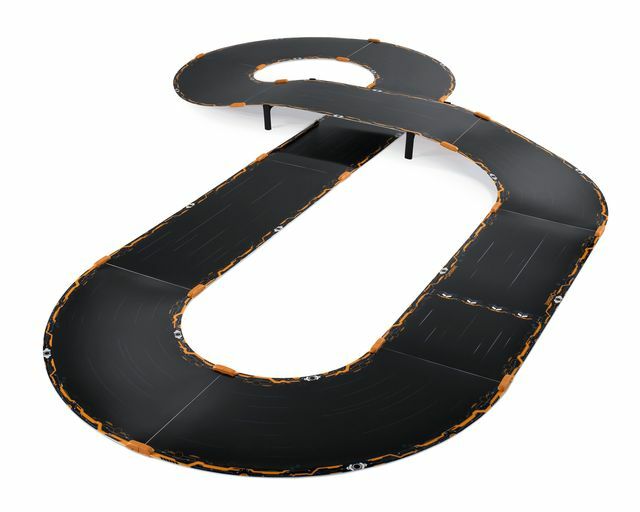 It’s competitive, tactical and lets you run wild with your imagination to build the tracks of your dreams. Setup is a breeze and it just works beautifully. It is quite pricey but you don’t need to buy everything at once and can add to your kit over time. It’s great fun for any age and sure to be at the top of many Christmas wishlists this year. Highly recommended.